Manfred von Richthofen is to Germany what Georges Guynemer is to France. Beyond the patriotic fervour they generated, they both confirmed the advent of a new race of warriors, the cold-blooded, calculating and methodical fighter pilots. 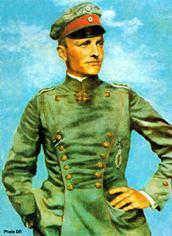 Unlike Boelcke, his mentor, Richthofen did not revolutionise air combat. He was not a genuine theoretician, not even a real leader; he may not have been a brilliant pilot either. But he strictly and precisely put into practice the set of rules he had devised for himself. His dismiss, in an arguably confused engagement, was received in Germany with disbelief and grief. To the British, it was a much needed "shot in the arm" for their somewhat harassed Royal Flying Corps. The sceptical German challenged that controversial version of the episode. Who actually shot down Richthofen? It is not easy to supply a plain, convincing answer. The question has been puzzling aviation circles for over eighty years, but, when all is said and done, is it such an important issue as some would make it appear? Aéro-Editions and Aérostories offer you to download an article on Manfred von Richthofen's last flight, which was published in Aero-Journal #20, April 2001 (this issue is out of print). 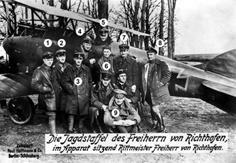 Richthofen and his pilots of Jasta 11 stand in front of one of their Albatros D.III in April 1917.